Activity in our brain shifts as we move through the different stages of sleep. As our consciousness wanes, most regions of our brain register gradually decreasing activity levels overall. This corresponds to the basic categories of brain waves that dominate various points in our sleep cycle. Sleep isn’t just a time to “power down” for our brain, though. We’ve covered how vital sleep is to our health: it’s the period when the biological processes that maintain our body kick in, from the release of growth hormones to the consolidation of memories we’ve made throughout the day. Contrary to what we might expect, sleep also means a period of activity for our body—and for our brain. That’s why we get sleep spindles, brain waves that signal complex activity in our brains while we sleep. Remember the stages of sleep? During Stage 2, which we called the point of deepening sleep, we starts disengaging from external stimuli. Our body’s automatic processes slow down: our heartbeat, our breathing, and so on. In the brain, theta waves begin to dominate. We spend half of our sleeping hours in Stage 2 sleep. This raises the question: what goes on in the brain in that time? Sleep spindles, one of the hallmarks of Stage 2 sleep, can help answer that question. 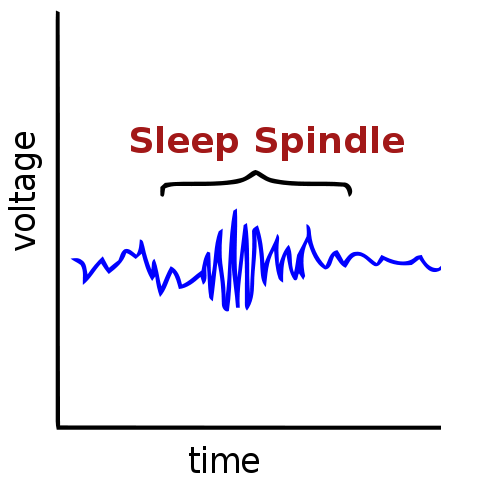 Sleep spindles are a type of brain wave. They register frequencies of around 12-16 Hz (a big contrast to the slower theta waves), and they occur in short bursts of around 0.5-1.5 seconds. They’re called “spindles” for the shape they create when monitored using an EEG. Slow spindles: These register frequencies in the 9-12 Hz range, and they typically arise from the brain’s frontal cortical regions. Fast spindles: These register frequencies in the 12-15 Hz range, and they typically arise from the brain’s central and parietal sections. Of these, fast spindles tend to appear earlier in the Stage 2 phase. Researchers speculate that these spindle types help create and sustain the cycle of slow-brainwave oscillations and slow-type spindles that drive various brain functions during Stage 2 sleep. What Are Sleep Spindles For? Speaking of functions, scientists are still trying to pinpoint what functions sleep spindles serve. What’s becoming clearer with every study, though, is that there are a lot. Studies have found, for example, that one of the most prominent sources of sleep spindles in the brain is the thalamus, which is associated with sensory processing and sleep modulation in the brain. Other sources include cortical regions related to encoding memory; in fact, researchers have noted that strong links between greater spindle activity and sharper recall. Sleep spindles have also been shown to spike in the nights following periods of new learning. After periods of intense skill training, research participants showed higher densities and longer durations of sleep spindle activity. This held true for both cognitive and motor skills, with participants demonstrating better performance in tests after a period of sleep marked by higher sleep spindle generation. On a related note, sleep spindles have also been shown to be closely linked with high marks on tests that measure intellectual ability. Beyond their apparently numerous contributions to our brains’ growth, sleep spindles are also suspected of playing a role in how we sleep every night. The thalamus, one of the prime generators of sleep spindles in the brain, is also involved in regulating our sleep. It makes sense, then, that scientists have found that sleep spindles signal greater activity in the parts of the thalamus that help us resist external stimuli. This phenomenon is called “sensory gating”: sleep spindles are somehow involved in inhibiting the processing of sensory information that we take in during sleep. This explains why we’re less likely to wake up during Stage 2 sleep. The general downshift in brain activity—from alpha- to theta-dominant brain waves—is only part of the explanation; it seems there are mechanisms actively safeguarding the integrity of our sleeping hours. Basically, the more spindles our brain registers, the more it’s working to ensure that we get deeper, more restful sleep. Thanks to their seemingly close links with memory, cognitive function, and sleep-related processes, sleep spindles have also been investigated as possible markers or signals of developing dysfunction in the brain. Many illnesses like Alzheimer’s disease and Parkinson’s disease, after all, count sleep disruptions and impaired cognition as common symptoms. And with how easily sleep spindles can be monitored through EEG, many researchers have been looking into the possibility of using sleep spindle patterns to detect or measure declines in brain function. A 2014 study, for example, demonstrated that losses in sleep spindle generation signaled higher chances of developing dementia in Parkinson’s disease patients. By contrast, other types of brain waves registered similar activity patterns regardless of whether the patients had dementia. Similar reductions in sleep spindle activity have also been detected in Alzheimer’s disease patients. Fast spindles, in particular, showed significant decline in people with Alzheimer’s disease, suggesting that the loss of these spindle types’ enhancing effect on slow-wave sleep plays a significant role in impaired recall and cognition. Similarly, schizophrenia patients have reduced sleep spindle activity, leading to impaired memory and cognition as well as exacerbating many of the illness’ symptoms. 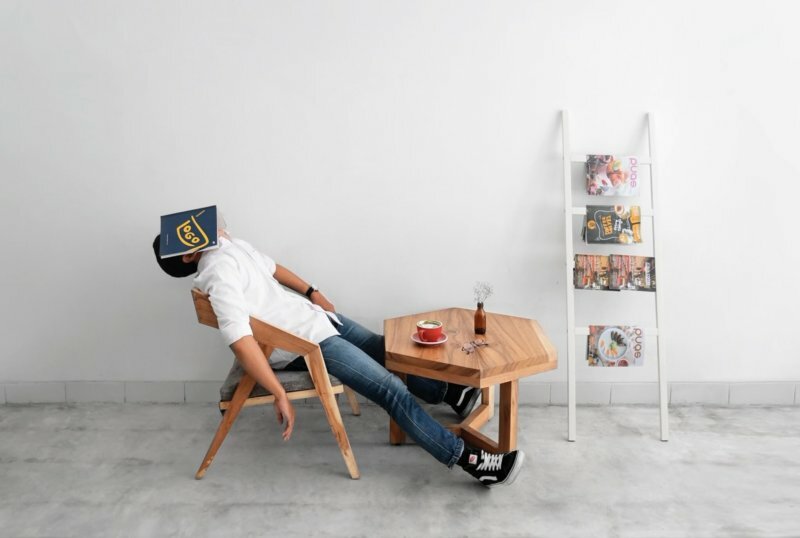 By contrast, people with major depressive disorder (MDD) were found to have much denser sleep spindle activity, implying a link between emotional regulation and heightened activity in our brain’s memory-processing regions.